Isadore (Issie) Coop was born in Winnipeg in 1926. He attended the School of Architecture at the University of Manitoba, from which he obtained his Bachelor of Architecture in 1948. Following graduation, Coop apprenticed with the architectural firm of Green Blankstein Russell (later GBR) and registered with the Manitoba Association of Architects (MAA) in 1951. Coop then attended the Illinois Institute of Technology, graduating in 1953 with a Masters of Science in Architecture. Here he studied under noted pioneer of Modern architecture Mies van der Rohe. Upon his return to Winnipeg Coop resumed his employment with GBR and was involved with such project as the new Winnipeg General Post Office on Graham Avenue. In 1956, Coop left his position to form a new partnership with Morley Blankstein, with whom he had worked at GBR. Three years later, they joined up with two other young architects, Alan Hanna and Doug Gillmor, to form Blankstein Coop Gillmor Hanna. The firm later joined with Waisman Ross architects and, in 1969, took the name Number TEN Architectural Group. In 1957, Blankstein Coop came second in an Alcan competition for a Toronto office building. The following year Coop and his partner Blankstein competed against 90 other architects in a national competition for the new Winnipeg City Hall; although they did not win, they received an honourable mention. The firm’s luck changed when the partners won a national competition for the Mendel Art Gallery and Conservatory in Saskatoon in 1962 (constructed in 1965) and an award for the Canadian Housing Design Council for a multi-housing development at the corner of Grant and Centennial. As Waisman Ross Blankstein Coop Gillmor Hanna Architects/Engineers the firm participated in many notable projects, including the University of Manitoba Student Union Building (also known as University Centre), the project for which Coop was most proud. During his time at Number TEN Architectural Group Coop worked on, among other buildings, Winnipeg Art Gallery, 1970. Number TEN, along with architect Gus Da Roza, served as associate architects, with Coop in the role of partner-in-charge. As wel, Coop was in charge of Design and Production in a consortium for the Winnipeg Convention Centre (1972-1974), the Royal Trust Tower and the Rupertsland Square Complex (1972-1974). 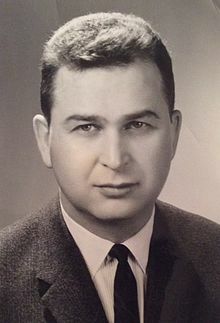 He was also directly involved with the design of the Canadian Embassy in Islamabad, Pakistan and the seven major building projects in the 1960s undertaken by his firm at the University of Manitoba. Among other organizations, Coop was involved with the YMHA, the Canadian Council of Christians and Jews, and served on the boards of the Manitoba Chamber Orchestra and the Royal Winnipeg Ballet. In November 1984, Coop was named the chief executive officer of the North Portage Development Corporation, for a five-year term. To do this, Coop had to give up his partnership in Number TEN. The North Portage Development Corporation was a tri-level organization that was controversial in its attempts to revive the north side of Portage Avenue with its Portage Place development. Coop resigned from this post on 17 October 1990. At this time the North Portage Development Corporation had a $600,000 annual operating budget and had spent millions in public funds with arguable success. Coop stated he wanted to finish up on some pet projects, but urged the civic government to include more housing in its future development of North Portage. Isadore Coop’s wife, Cynthia Coop, was a graduate of Interior Design at the University of Manitoba and taught on staff there from 1963 until her retirement in 1989. She and Issie had three children born in the 1950s. They lived first at 732 Waverley Street and in the later years at 251 Harvard Avenue. “Isadore Coop: Biography.” Manitoba Association of Architects File. Undated. “Isadore Coop named fellow of the RAIC.” Winnipeg Free Press, 20 June 1964. “Untitled.” Winnipeg Jewish Post, 18 June 1964. 4. “Untitled.” Winnipeg Jewish Post, 6 May 1958. 4. “Winning Design Mendel Art Centre Competition.” Perspective (1963): 14. McKinley, Patrick. “Coop to get $125,000 salary: Portage Development head's contract runs five years.” Winnipeg Free Press, 2 November 1984. 1. Rollason, Kevin. "Architect changed the face of Winnipeg." Winnipeg Free Press, 4 December 2003. 5. Thampi, Radha Krishnan. “Coop quits downtown agency.” Winnipeg Free Press, 17 October 1990. 1. Thompson, William P. Academic Influence: A Legacy Unpublished manuscript. Winnipeg: March 2000. 3.